Who doesn’t love a quick and easy snack idea that is clean and a breeze to make?! Everyone loves that, right?! Or am I right? 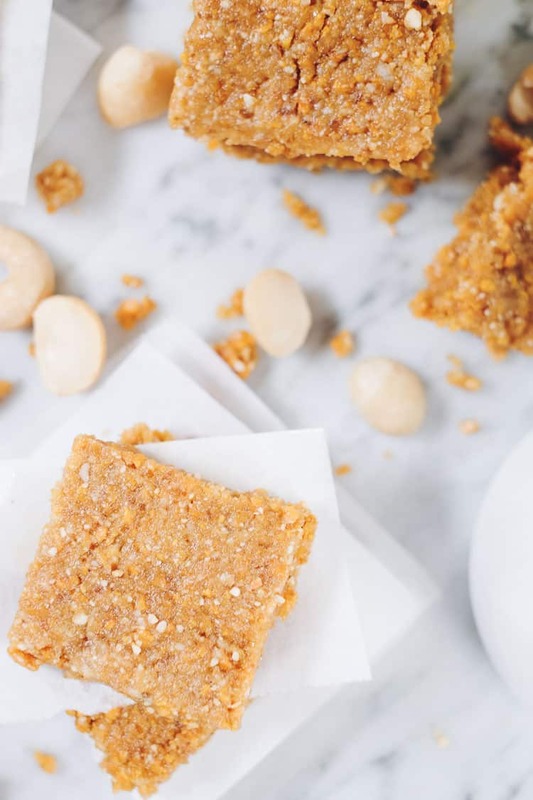 These no bake mango bars are one of our favorite snacks to make and have on hand. Our meal plan subscribers love them, too! We love simple recipes, and these no bake mango bars are great because they only require seven ingredients. You just combine all of the ingredients in a food processor and then press the mixture into a pan. 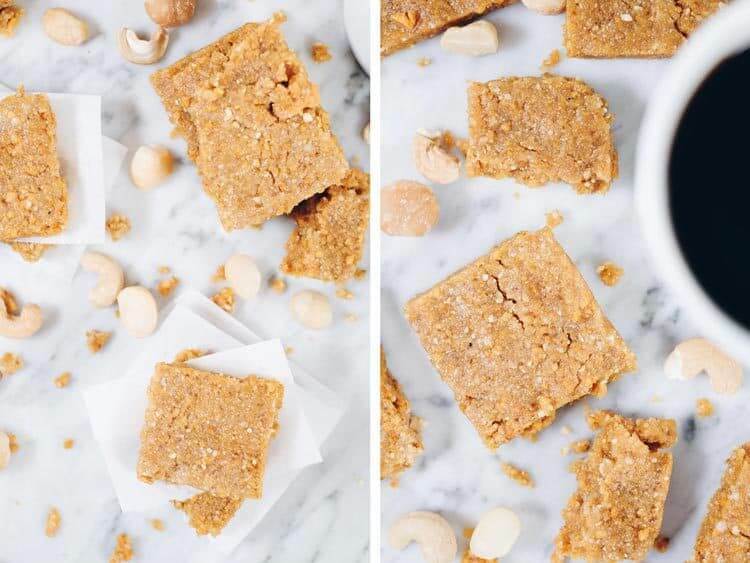 Once the mixture sets in the fridge, you can cut it into squares or bars and have a real food snack ready to go whenever you need it. Well, in short, collagen is really good for you! I try to get a serving of it in every day. Collagen is a protein found in our bodies. It is most prominent in the connective tissues and bones, and you can get collagen supplements in the form of hydrolyzed collagen peptides or gelatin. The benefits of collagen are that it is great for your gut, hair, skin and nails among other things. 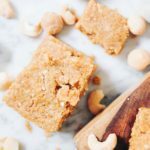 Collagen is the perfect addition to recipes like these no bake mango bars and also to your coffee or tea in the morning, smoothies and really just about anything. It dissolves completely and is tasteless. Basically, it’s a no-brainer, and we should all be adding collagen into our daily routine. We use and love the brand Perfect Supplements. Their hydrolyzed collagen is sourced from grass-fed cows, and we love the mission and practices of Perfect Supplements. We love partnering with them as an affiliate, and use their products regularly. You can get 10% off any Perfect Supplements order using our discount code “RSG10”. We do earn a small commission when you shop using our link, which helps to keep Real Simple Good running. Our promise to you is that we only promote and share brands we personally love and use. Thanks for your support, you can shop here! Our Paleo meal plans are one of our favorite ways to help people make eating clean manageable and fun. With simple tips like making breakfast and snacks ahead of time, our subscribers find it easy to eat well, especially during the busy work week. Even if you aren’t interested in committing to our meal planning service, you should consider just a few meal prep ideas to help make your weeks less stressful. 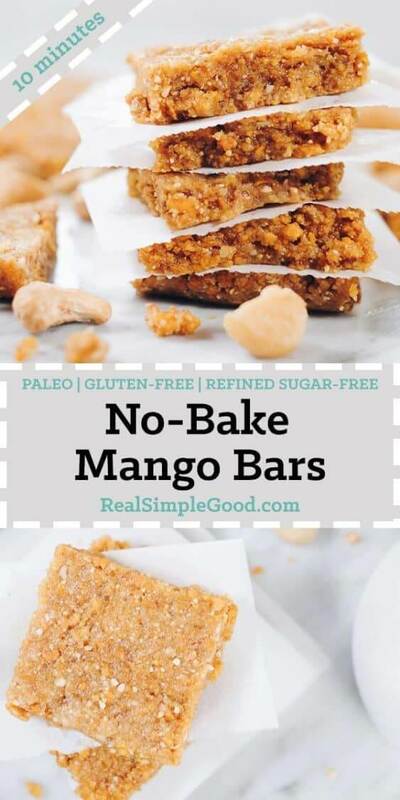 Try making these no bake mango bars over the weekend, and then having them on hand during the busy week ahead. You’ll have a clean option at your fingertips when hunger strikes! 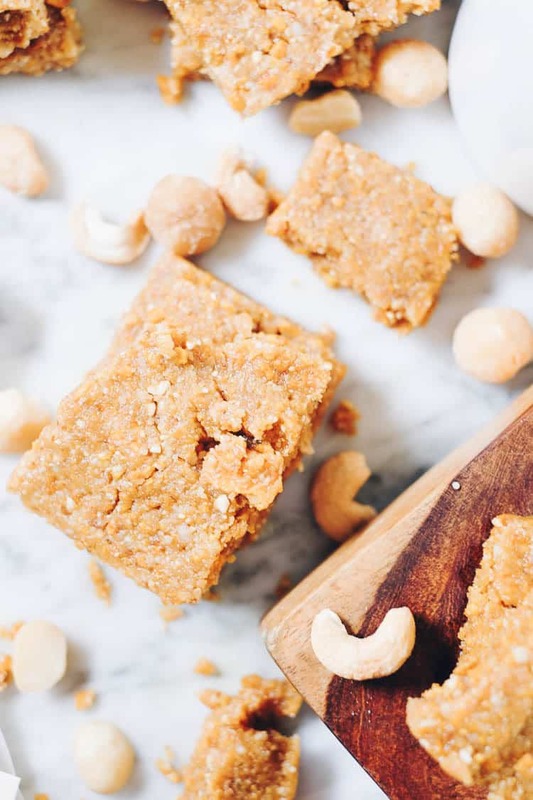 Go ahead and make these no bake bars a part of your weekend meal prep and enjoy an easy and clean snack throughout the week. Let us know how it goes by leaving a comment below. Also, take a photo and tag us on Instagram @realsimplegood, so we can check it out! 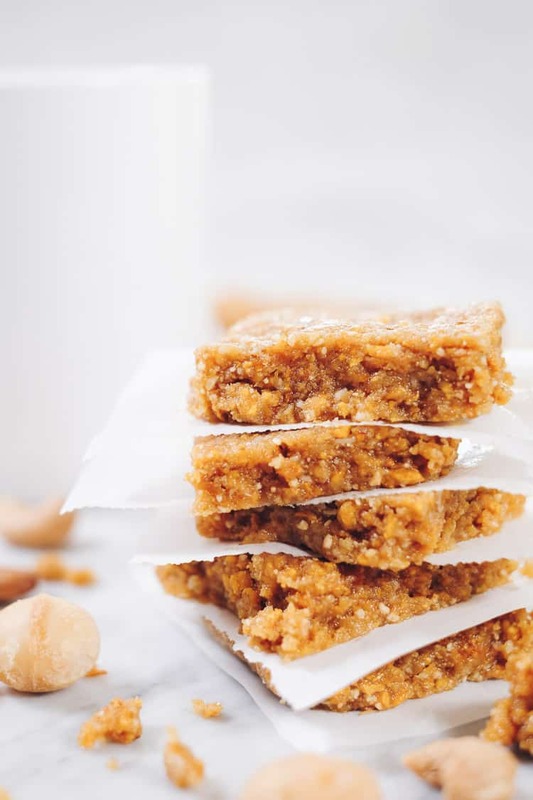 These no bake mango protein bars are easy to make and a great grab and go snack! Add all the ingredients to a food processor. Pulse a few times just to break them up. Separate the dates if they start to clump together. Process continuously for 30 seconds. The ingredients should all be broken down into crumb-sized pieces. Scrape the edges of the bowl to make sure nothing is sticking. Process continuously for another 2 minutes or so, until the ingredients start to clump together and gather into a ball. They may not completely ball up, but process until at least some clumps are forming. Line a 9"x9" square baking dish with parchment and dump the dough on top. Press the dough with your hands into an even layer. Cover and chill for at least an hour. Uncover the chilled dough and transfer to a cutting board. Cut into 8 bars or 16 small squares, as desired. Store in an airtight container in the refrigerator for up to two weeks. We have found dried mango without sugar at Trader Joe’s. We’ve also seen a brand called Made in Nature that doesn’t have sugar. Or, feel free to substitute any other plain dried fruit. 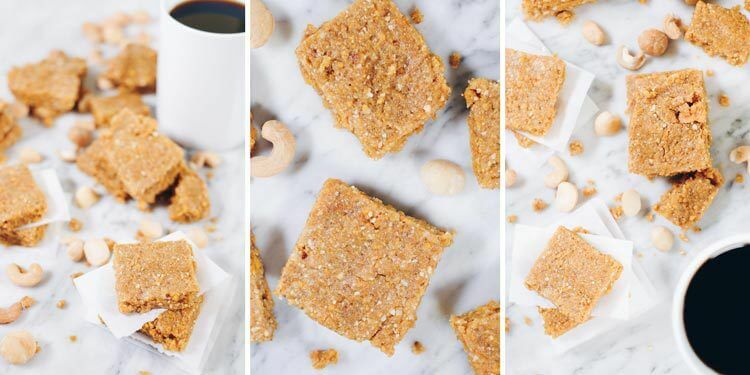 I wanted to make these as a healthy snack and treat for my husband and young son. The mixture actually BROKE my food processor (it overheated the motor), as there were no liquid ingredients and only hard solid ingredients. So now I have to buy a new blender and food processor (they’re a set and the motor/top goes to both). I used my bullet to finish it out. They kind of formed a dough. I chilled for close to two hours and they completely crumbled and broke apart when I cut them up. This blog has been so great for meals but I would definitely not make another treat from here, sadly. So sorry to hear that this happened. We’ve made these in our food processor several times just fine. I don’t know why this would happen or why the bars crumbled.